New Brunswick, N.J. – Recognizing what would have been the 10th birthday of little Brady Wells, Brady’s parents Sherrie and Michael Wells – founders of the Hugs for Brady Foundation – have announced a $500,000 pledge to Rutgers Cancer Institute of New Jersey to support a dedicated laboratory space for pediatric cancer research. The couple is all too familiar with the need to fund pediatric cancer research, as it was a rare, aggressive blood cancer – acute undifferentiated leukemia – that took Brady Michael’s life in 2010, just a few weeks before his second birthday. A previous commitment to research by the Foundation established the Hugs for Brady Foundation Pediatric Young Investigator Award at Rutgers Cancer Institute. The aim of that support was to foster the early career development of a promising young scientist while they pursue innovative pediatric cancer research. Other support from the Foundation focused on precision medicine efforts to analyze genomic profiles of pediatric patients to better understand their cancers and improve treatment options. The Wells’ are hoping this latest pledge will have a profound impact on the lives of patients and families who have shared a journey similar to theirs. “While childhood cancer survival rates are generally high, there are still approximately 15 percent of youngsters battling cancer that will not live beyond five years. With that, it is critical to have dedicated funding sources that support exploration specific to pediatric cancer. 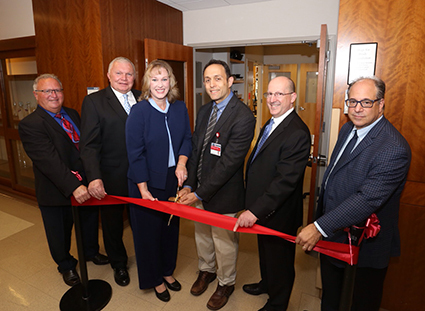 We are grateful to Sherrie and Michael Wells and the Hugs for Brady Foundation for its continued dedication to this important mission,” notes Rutgers Cancer Institute Chief of Pediatric Hematology/Oncology, Peter D. Cole, MD, who is also a professor of pediatrics at Rutgers Robert Wood Johnson Medical School. Dr. Cole is leading precision medicine and immunotherapy exploration in the Hugs for Brady Foundation Pediatric Cancer Research Lab as well as other advanced research as part of the Pediatric Hematology/Oncology Program. Cole has vast clinical research experience, having worked with investigators at other cancer centers across the country, as well as with national collaborators such as the Children’s Oncology Group for nearly 30 years.